Sony Computer Entertainment Inc. (SCEI) announced its plans for the global release of a new, redesigned PlayStation 2(PS2) computer entertainment system (SCPH-70000 CB) in time for the year-end peak-selling season of 2004. The new model was to be in stores on November 3 in Japan, and by November 1 in Europe and North America. While inheriting the basic functions and design philosophy of the exisitng PlayStation 2 (SCPH-50000), the internal design architecture of the new model had been completely overhauled, resulting in a slimmer and more lightweight form. Internal volume has been reduced by 75 percent, overall weight has been halved, and thickness trimmed down to 2.8 cm (thickness of current model is 7.8cm). Its size is almost as small as a hardcover book, making it easier to carry around and enjoy games and DVD videos anytime, anywhere. Equipped with an integrated Ethernet port for network gaming, the new PlayStation 2 set new standards in the fusion of design and functionality and enabled the company to maintain market momentum as it expanded its online console gaming community, the largest in North America with more than 1.4 million users. Approximately 40 percent *1 of North American PlayStation 2 online gamers used dial-up connections and to satisfy this base, the North American model is equipped with both Ethernet and modem ports. During the year-end peak-selling season about 80 online game titles were expected to be available in Japan, with 120 titles and 65 titles respectively in North America and Europe. With the launch of the new network-ready *2 PlayStation 2, the company expected to continually expand the world of online gaming in that generation. "The introduction of the new PlayStation 2 is part of our long-term vision for the platform," said Jack Tretton, executive vice president, Sony Computer Entertainment America. "We are pleased to bring the sleek, redesigned product to market in time for the holiday season, and expect consumer enthusiasm for the new model to translate into robust sales. As the market leader, with an existing installed base of more than 27 million PlayStation 2 units in North America alone, we will continue to provide solutions that expand our consumer base and grow the category as a whole." Gaining overwhelming support from a wide range of users from all over the world, more than 72 million units of PlayStation 2 had been shipped. Strongly supported by software developers and publishers, PlayStation 2 was indisputably the most popular computer entertainment system in the world and the new design positioned it for even greater success over the next half of its life. Smaller PlayStation 2 Product Outline: Japanese, North American, and U.S. Compatible format: PlayStation format CD-ROM, PlayStation 2 format CD-ROM, PlayStation 2 format DVD-ROM, Audio CD, DVD-Video*, DVD-RW (VR mode). *The term "DVD-Video" is used to refer to DVD-R, DVD-RW (Video mode), DVD+R and DVD+RW discs. Compatible format: PlayStation format CD-ROM, PlayStation 2 format CD-ROM, PlayStation 2 format DVD-ROM, Audio CD, DVD-Video*, DVD-RW (VR mode), * The term "DVD-Video" is used to refer to DVD-R, DVD-RW (Video mode), DVD+R and DVD+RW discs. Included: PlayStation 2 console x 1, Analog Controller (DUALSHOCK®2) x 1, AV Cable (integrated audio/video) x 1, AC Adaptor (AC power cord included) x 1, *North America and United States models (SCPH-70011/SCPH-70012) come with built-in modem port in addition to Ethernet port. 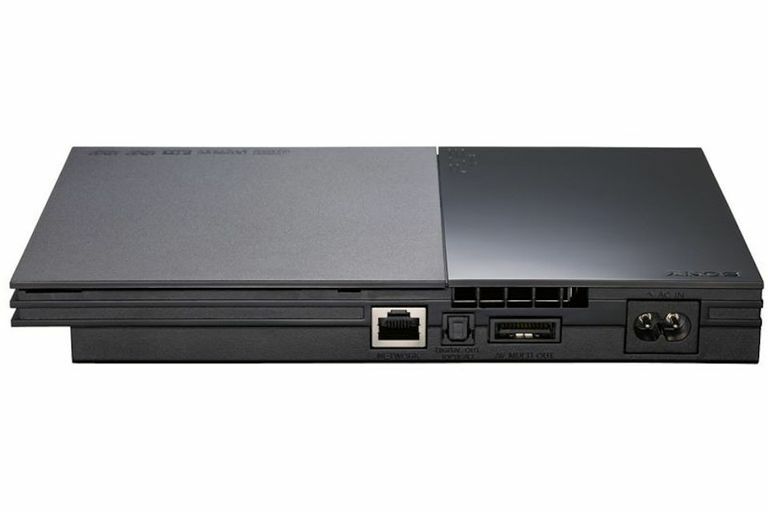 The Vertical Stand for the current model cannot be used with the new model PlayStation 2 (SCPH-70011 CB, 70012 CB), due to difference in design. The Multitap for the current model cannot be used with the new model PlayStation 2 (SCPH-70011 CB, 70012 CB), due to difference in design. The new Multitap offers the same function as the current Multitap. *1 According to SCEI's DNAS (Dynamic Network Authentication System) data. *2 Internet Service Provider and appropriate Internet access (e.g. ADSL, cable, fiber, etc.) required. For further details regarding network connection, on-line games and peripherals supported with the new model (SCPH-70000 CB), please visit our customer support website http://www. us.playstation.com.